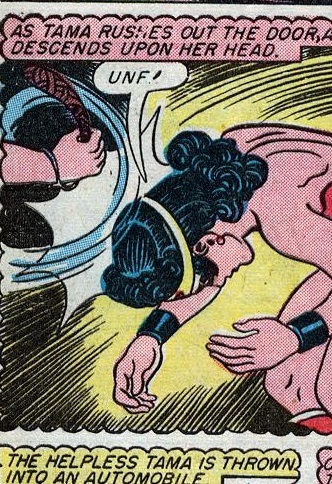 Tama, dressed up like Wonder Woman, is knocked out by a black jack, bound and gagged and kidnapped. Wonder Woman meanwhile has also been chained. This is neat. Another girl, Tami, dressed as Wonder Woman gets blackjacked just as the real Wonder Woman does so often. She looks cute with the mask on as she is knocked out.